Special thanks to Brian Slaughter of LIBO Construction for replacing the posts that hold up our widely recognized sign! Well, here we are! In 21 days, our home mountain will be open! We’re gearing up, getting new merchandise daily. Tomorrow marks the official start to the local ski season–The Hesperus Ski Patrol Ski Swap! 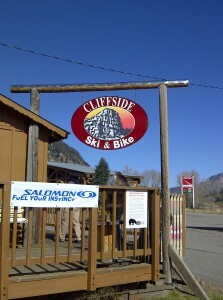 We’ll be at Cliffside from 10 – 4 on Saturday and Sunday to help outfit the family in skis. We had a special visit from the Silverton School yesterday–thanks to Nipper Alsup and Coach Sallie for brining all the kids down for their season rentals. We also have a special discount to offer all our customers from Needles Liquors–if you mention this blog, you can get the Blackstone Merlot for $9.99 per bottle, a $1 savings! We hope to see you soon! The weather is looking good! Check out http://forecast.weather.gov/MapClick.php?CityName=Rico&state=CO&site=GJT&textField1=37.64&textField2=-107.832699 to see what’s in store for us this weekend!! Comments Off on SKI SWAP WEEKEND SPECIALS!